Hunter Warden just wants some peace and quiet. He wants to watch unboxing videos and be lulled to sleep by the monotone voices and smooth talking YouTube hosts. He wants his parents that are always working to either totally leave him alone or be around for once. After a few beers, Hunter decides to get away from it all and go for a run in Falter Kingdom. When you run the gauntlet at Falter Kingdom, a tunnel next to a park on the outskirts of suburbia where local high school kids go to drink and smoke, one of two things can happen — nothing or you catch a demon. The cold spots, locked doors, scratches on the wall, and disappearing laptop immediately alert Hunter to the fact that a demon is haunting him. He knows the signs, he’s seen the videos of people that are possessed, and everyone knows someone that has had to get an exorcism. Hunter knows that he should get rid of it, but he can’t help but enjoy the company of “H,” despite this demon’s sinister intentions. Hunter is an apathetic teenager that finds himself at Falter Kingdom one night. Falter Kingdom is a Tunnel that the local kids hang out to drink, smoke or make out. But it is also known as the place to get possessed by a demon. Hunter decides to run the tunnel and ends up possessed by H. Although he knows he should get H exorcised he is also lurid into the spell of H. H brings that missing spark back to Hunter’s life. The more that Hunter keeps H the further he falls under the spell and is less likely to exorcise him. Hunter is a bland character that wants his parents to dote on him or leave him completely alone. He has no real desire to do anything and finds himself in the company of people he doesn’t like and won’t leave. He decides to be possessed and finds he likes H’s suggestions. I liked hwo the further you got in the story H went from a “he” to “us”. You could feel Hunter falling completely under H’s spell. Unfortunately, Hunter was such a bland character that I found myself not really caring about him. Everyone around him was likewise flat. This was not a bad book but I thought that it would have a little more to it. To purchase Falter Kingdom make sure to visit Amazon, Barnes and Noble, Goodreads and Michael Seidlinger’s website. 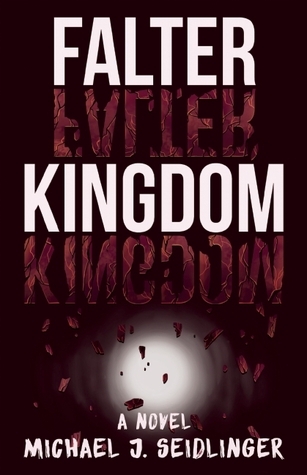 I received Falter Kingdom for free from the publisher in exchange for an honest review.